Hi everyone! Welcome back to the world of handwriting analysis. So, have you asked yourself these questions a lot; “Where is it? or where did I put it?” Do you frantically hunt through papers for that ‘bill’ you misplaced? Perhaps then, you lack the ability to be organized. In the first ‘F’, a simple line shows upper and lower balance. This writer can maintain order. Ask her to sort through papers, and then file them, and she has no problem. She would make a good Secretary. 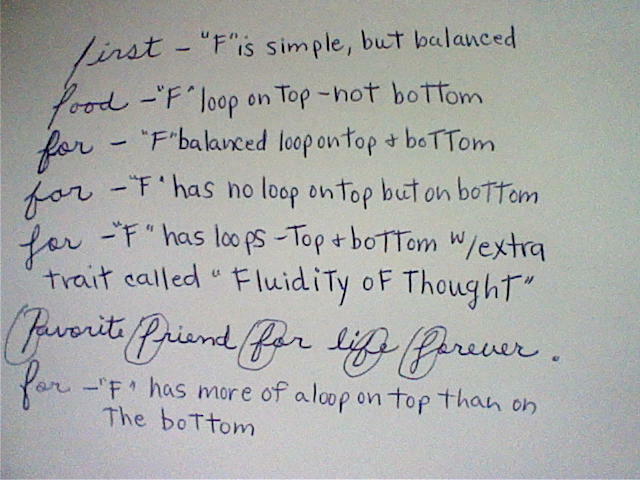 So, I hear some of you saying “Well I have that ‘F’ except with a loop on top.” This causes an imbalance in your ‘F’. When you see a loop, you see an indication of imagination. Sure you have the imagination to devise methods or plans. But, may not know how to put them into action; no loop on bottom-no imagination in that area. Now for those who say”Well I have imagination on the bottom part of my ‘F’. But no loop on top! ugg! What does that mean?” Don’t worry you are able to coordinate people and materials with no problem. If your Boss has the plan, you can organize and carry it out. Your imagination is in the action area. So, can you guess what kind of organizational ability you would have if your ‘F’ is balanced with a loop on top and bottom? You got it! You are organized in making plans, having ideas, and then carrying them out. The last ‘F’ is unusual. It has a loop up top and bottom, but going in different directions. This ‘F’ shows an extra trait called “Fluidity of Thought”. This person will go from one thought to another . His thinking and speech will flow easily and smoothly. You will also see this trait in the letter “g”. It looks like the number “8”. Some writers may even connect words together as they think rapidly. “Desire For order” is also kin to “Organizational Ability”. You will see the traits of dignity and rhythm go hand in hand. Also, there will be no other handwriting strokes going into the lines of writing below. They like order, not disorder and confusion. Don’t ask them to do something at the drop of a hat. They won’t have too many ‘irons in the fire’. Hi, my name is Loretta Littlefield but I go by my middle name, Ann. I am a proud mom and Nana and also a devout follower of Jesus Christ. I also study handwriting analysis. I am a CNA (Certified Nurse's Assistant). You will find health information and info on handwriting analysis on this blog.